In keeping with that idea that if you're going to do something stupid, make sure it's really stupid, I took my SS out to Lysterfield Park to race a 6 hour enduro. It came as a surprise to me that during my warm up I had no poke in my legs. Honestly, I know I raced hard for 3 hours the day before, but surely a chicken parma, a large bowl of pasta, a small pizza and a large pizza should have restored me to peek physical condition? I started pretty easy, needless to say, the giant bag full of excuses I was carrying slowed me down a bit. Still it's kind of nice not playing the elbows out game up the front. The course seemed to be an even mix of fun single track, climbing and flat fire roads. One of those things was great fun on the SS, the other two... not so much. That aside, I threw out the old idea of "solo is all about finding the most efficient way to ride the course", and instead subscribed to "solo is all about finding the most fun way to ride the course". There were several sections that elicited outcries of joy. "Whee", no wait that looks a little odd, "Weee"? Hrm still not right "Wiii"?. Ok, how about I let you hear what I mean, and you decide on your own spelling. So, just like that, but with more of a 4 year old on a swing characteristic. To be fair after 5 hours of pedalling it sounded like the child was just trying to keep it's parent(s) happy, but they happened every time I was airborn or sideways. Around lap 3 I decided to ride with Mel of Ben and Mel fame. I decided that her pace was much more fun. Ok, so that's not entirely the truth. The truth is, she rode past me as if I was standing still, and laughed as she did so. Somehow the joy in her voice triggered both my Pride and Spite glands to increase the secretion of pain tolerance hormones to my legs. The fire roads were the biggest killer on the SS. Mostly I was able to draft a geared rider. 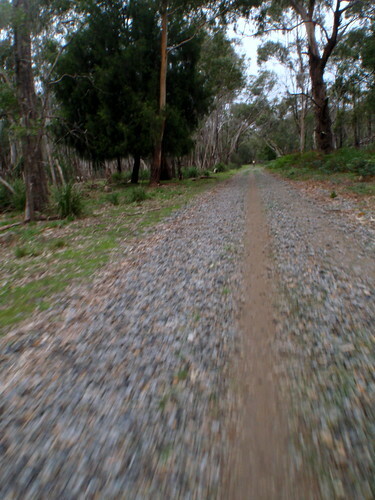 Spinning my ring off then coasting for the kilometre long sections. As the rain started to fall in the last couple of laps I went from copping a few bits of earth to copping a face full of dirt, water and dirty water. I finished up with 6 laps. I'd predicted I could just squeeze in 7 and the winners got in 8. Still I happy as I managed to clock up 100km, and that's a a decent effort on any day. Result: 24th out of 69 solo males. Not quite the top 1/4 that I'd hoped for, but I know there's a bit of room for improvement both mentally and physically.